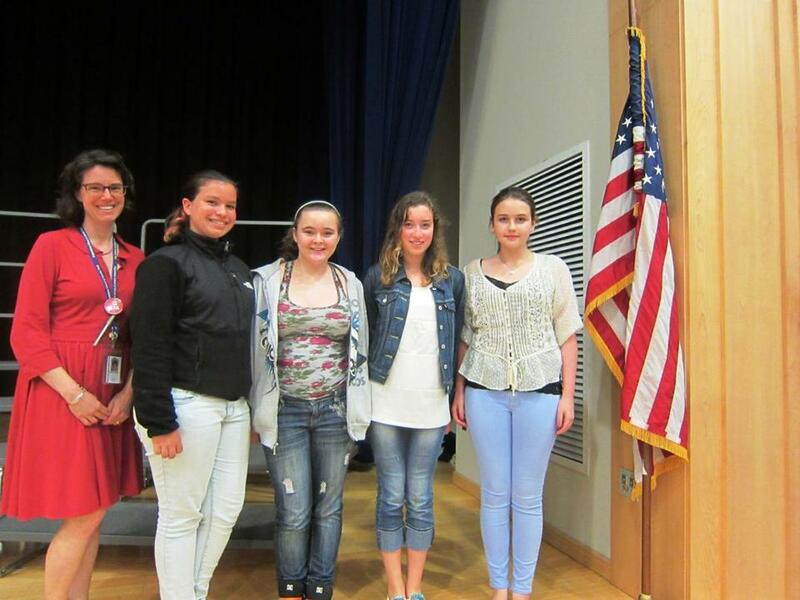 Argenziano School social studies teacher Sharyn Lamer (left)and some of her students (from left): eighth-graders Emily Liberato and Molly Roderick and seventh-graders Fiona Borondy-Jenkins and Meret London-MacFadyen. SOMERVILLE — The first time social studies teacher Sharyn Lamer saw the documentary “Girl Rising,’’ she knew she needed to share its message with her students at the Dr. Albert F. Argenziano School in Somerville. The film tells the true stories of nine girls in nine countries who overcame such obstacles as poverty, sexual assault, and slavery in their pursuit of education, and explains the personal and economic benefits of educating girls. When it came time to decide on topics for the Middle Grades Project , an in-depth, student-directed culture assignment for seventh- and eighth-graders, Lamer had four students in mind that she knew were capable of spreading awareness of the importance of girls’ education to their peers and the wider community. “In my world geography class, we discuss these issues, and I show them similar videos about girls’ education, and these girls really responded to it, said Lamer. On May 29, seventh-graders Fiona Borondy-Jenkins and Meret London-MacFadyen and eighth-graders Emily Liberato and Molly Roderick hosted a screening of “Girl Rising’’ in the Argenziano cafetorium for an audience of about 35 fellow students, parents, and local residents. By selling tickets and refreshments, the students raised $300 for 10x10 , the social action campaign that created the film and helps fund education programs for girls in need. The girls said that after watching the girls in the movie struggle to go to school, the Somerville students gained a new perspective on their own education. The students said the multifaceted project was a new kind of challenge for them. In order to host the screening, they had to get permission from school officials, reserve and rent the screening space, obtain snacks, buy the DVD from 10x10, attend meetings, produce fliers to hand out after the viewing, and write a promotional article for the local press. They said their hard work was worth the effort when they considered the movie’s message. “If all girls started getting educated the way they do in the US, that would make such a big impact on everything else,” said London-MacFadyen. Lamer said she was impressed with the group’s ability to pull the event together in a month and she was happy to see some faces she didn’t recognize in the audience. As the Somerville students approach high school, they said they may pursue the issue of girls’ education, possibly with a “Girl Rising’’ club. “I wouldn’t be surprised at all if these girls get involved in other organizations to promote global awareness,” said Lamer. London-MacFadyen said that she has hope that change can happen when girls worldwide are given a chance to thrive academically.